Following more than two hours of dinner talks between the two leaders, the White House said an increase of tariffs from 10 to 25 percent due to kick in on January 1 would now be put on hold. White House called the meeting between Donald Trump and Xi Jinping "highly successful". US President Donald Trump and China's Xi Jinping agreed Saturday to suspend any new tariffs in the escalating trade war between the world's two largest economies, even if huge existing duties will remain in place. The two leaders, who were in Buenos Aires for a summit of the G20 countries, called it "a highly successful meeting," a White House statement said. "It's an incredible deal," Trump told reporters aboard Air Force One on the flight home to Washington, adding it would have an "incredibly positive impact" on American farmers. Xi avoids further immediate pressure on China's slowing economy, while Trump -- scarred by last month's midterm elections that saw the Democrats regain control of the House of Representatives -- can ease damage to agricultural US states that export to China, particularly soybean producers. "China will be buying massive amounts of product from us," Trump said after the talks. For Beijing-based political consultant Hua Po, "this was a rare opportunity for China" to capitalize on what they saw as Trump's compromised position after the midterms. "At this time, it was acceptable for China to maintain some bottom lines while making some major concessions." "The hard part is finding the basis for a real deal that settles the broader issues rather than agreeing on a pause," Setser said. Some $50 billion worth of Chinese imports already face 25 percent tariffs, while the 10 percent tariffs -- which target a massive $200 billion in goods -- will also remain in effect. The White House made clear that the 10 percent tariffs would still leap up to 25 percent if China doesn't meet US demands in 90 days. 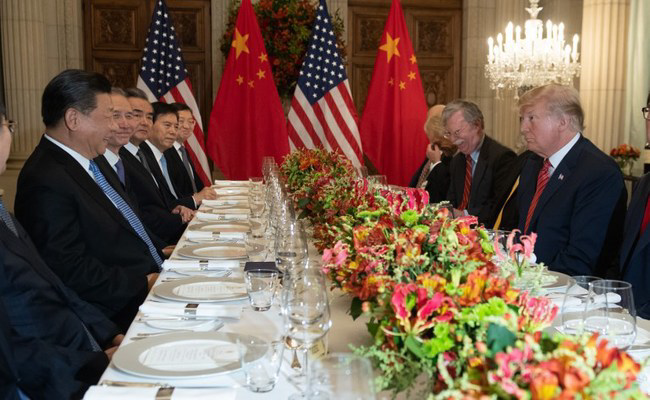 "This was an amazing and productive meeting with unlimited possibilities for both the United States and China," he said in a statement. The meeting -- featuring a menu of sirloin steak, caramel rolled pancakes and Argentine wine -- went on longer than scheduled. At the dinner, Trump said his ties to Xi were "a very primary reason" for considering a deal possible.